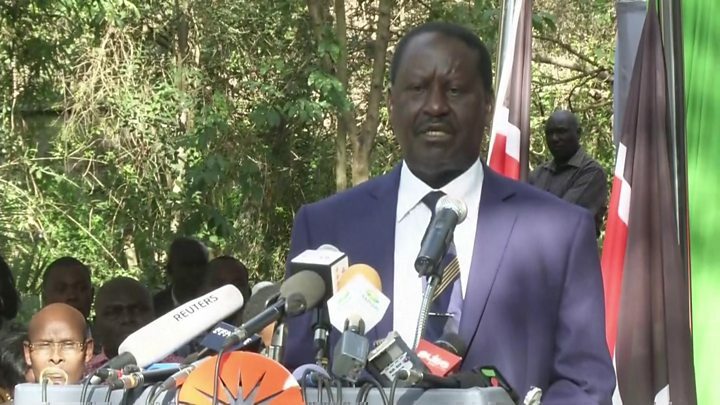 Kenyan opposition leader Raila Odinga has rejected the results of the re-run presidential election that saw Uhuru Kenyatta gaining a second term. Mr Odinga called it "a sham" but made no mention of any legal challenge. Mr Kenyatta won 98% of the vote with turnout under 40% - less than half that recorded in August's vote, largely because of an opposition boycott. The Supreme Court annulled the first vote in August citing "irregularities and illegalities". In his first official reaction to the re-run, Mr Odinga called for a "national resistance movement" including the formation of a "people's assembly" to bring civil society groups together to "restore democracy". But he did not explain how that would work. "This election must not stand .... It will make a complete mockery of elections and might well be the end of the ballot as a means of instituting government in Kenya. It will completely destroy public confidence in the vote," he said. The BBC's Alastair Leithead in Nairobi says that Mr Odinga's response to the election result was short on substance. The opposition leader repeated claims that the re-run of August's presidential poll was unconstitutional - lawyers from both sides are still arguing about this, and the Supreme Court has a petition pending. "We will not allow two megalomaniacs [Mr Kenyatta and his deputy] destroy the dream of freedom and democracy," Mr Odinga said. He has appealed for calm and promised Kenyans that "their neighbour will remain their neighbour" despite political uncertainty.